The current flag scored a 3.18/10.00 in NAVA’s North American flag survey, which makes it the 10th worst rated. 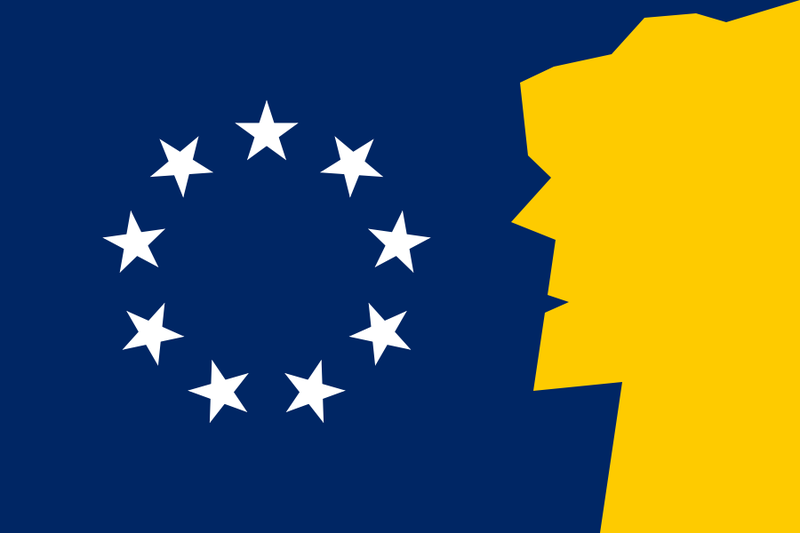 Flag proposal of New Hampshire I made in 2009. Inspired by the state quarter, the overall scene depicts the “Old Man of the Mountain”, a well known symbol of New Hampshire, against the sky, which is in the same shade as the blue on the national flag. On the sky is a circle of nine stars in an arrangement echoing the historic Betsy Ross flag and the recent flag of New England. 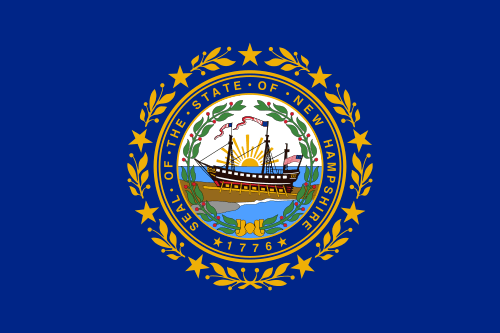 There are nine stars because New Hampshire was the ninth addition to the United States. 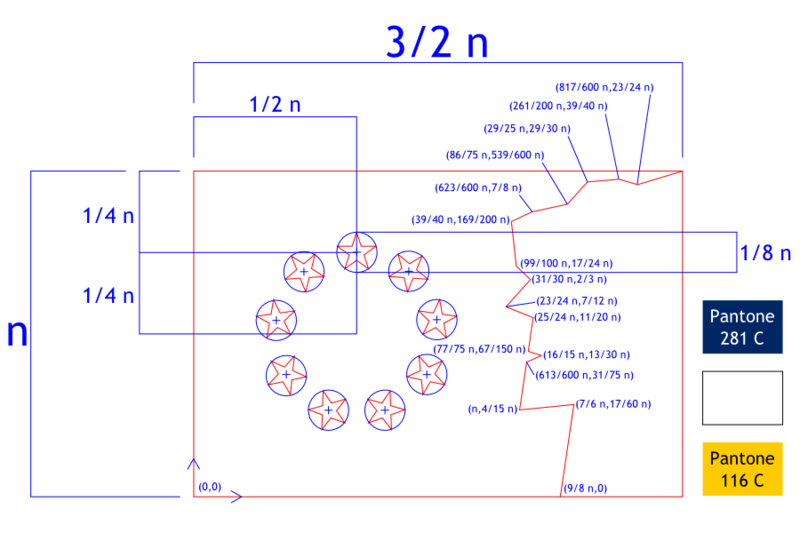 The blue background with the circle of stars, strongly suggesting the national flag, is the dominant part of the design, to represent how New Hampshire was one of the original thirteen states. By representing the Old Man of the Mountain, New Hampshire’s official nickname “The Granite State” is also accounted for, as the Old Man was composed of granite. The colours are all present on the current flag, so any further symbolism they have can be carried over as well. The current flag scored a 4.98/10.00 in NAVA’s North American flag survey. Not the worst, but could be improved for sure, and I had a great idea I couldn’t wait to try out. 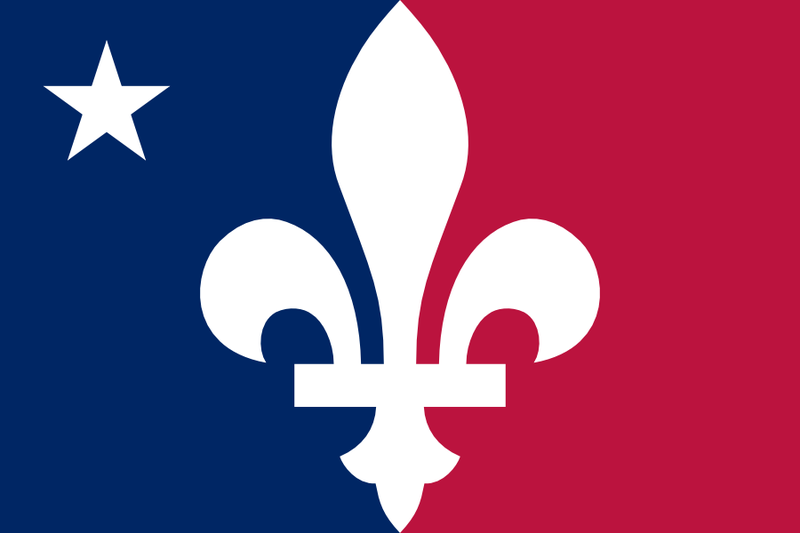 Flag proposal of Louisiana I made in 2009. The background layout of this design echoes one of the most recognisable flags in the world, that of France. Indeed, Louisiana was colony of the French Empire and its French legacy and influence is still visible today. However, instead of a stripe, the white divison is a fleur-de-lis, another reminder of French historical connections, but from the royal era. 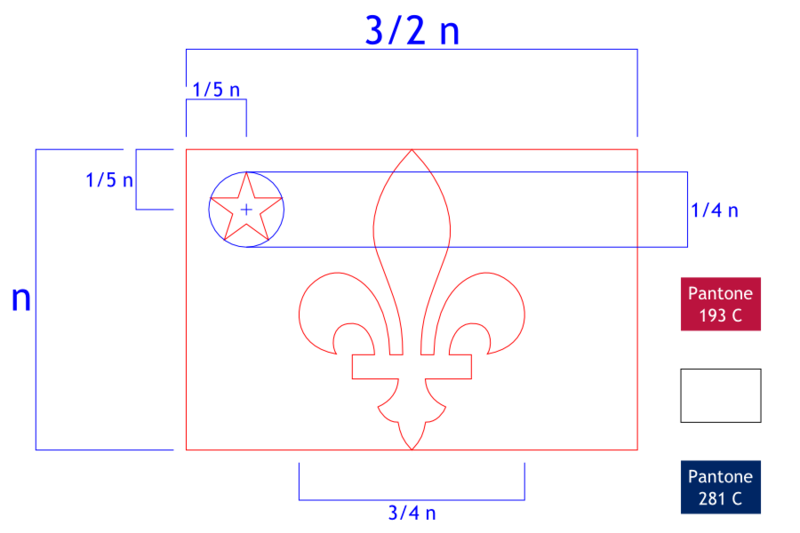 As an old French symbol, it featured on many early flags that flew in that region. It is also significant in modern times. 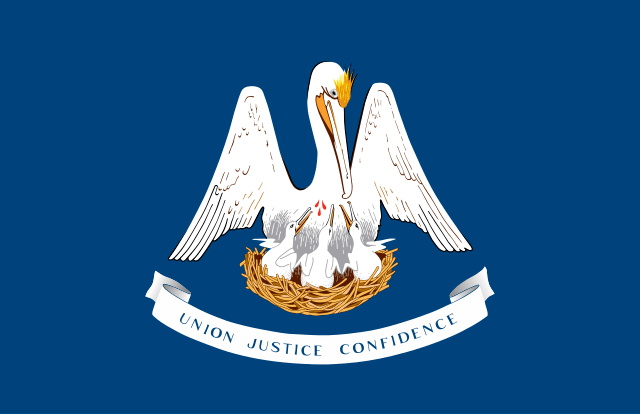 For example, it was frequently used as a reminder in the aftermath of Hurricane Katrina and was made an official state symbol in 2008. The star in the top left corner, in conjunction with the blue, reinforces Louisiana’s status as a U.S. state. It does this by echoing the pattern in the top left corner of the national flag, where each white star on blue represents a state. 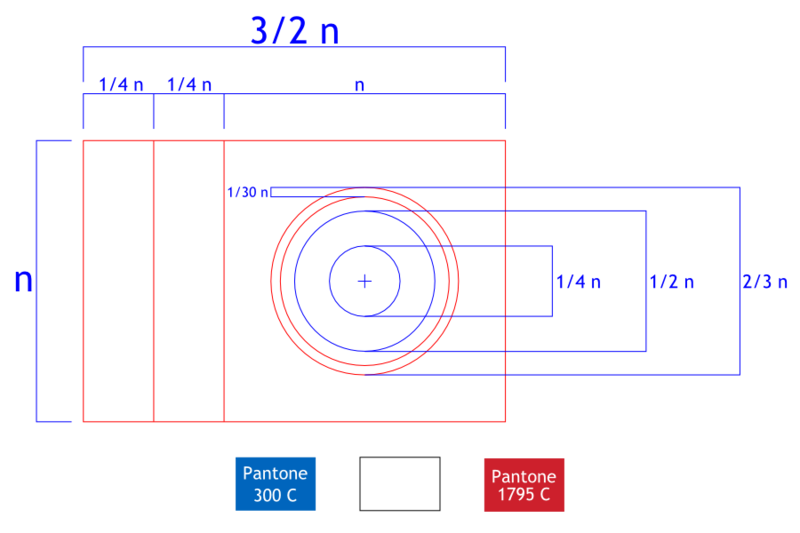 In fact, the shade of blue is the same as the one on the national flag. The blue stands for the sky and sea. The white stands for the coastline and peace. The red stands for the blood that we all share and that has been shed in the past. The colours are all present on the current flag, so any further symbolism they have can be carried over as well. Additionally, blue and white are official state colours. This proposal has taken on a life its own and gone viral since 2009! It was adapted for regicollis’ DeviantArt project and Ben Karnell’s list of best US state proposals. 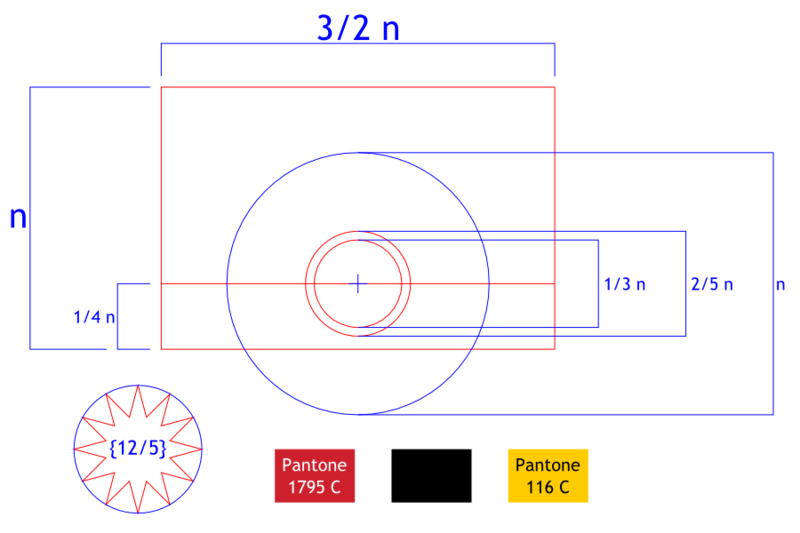 In its original form, my design was also directly plagiarised and claimed by a user on the Vexillology Wiki (not cool!). I’m pleasantly surprised – I never promoted these pages anywhere else, and I never expected this particular design to get popular. A good design is adaptable, spreads on its own merits and is worth imitating, so I’m happy that this design is proven to be good on such terms. The current flag scored a 3.17/10.00 in NAVA’s North American flag survey, which is the 9th worst rating. 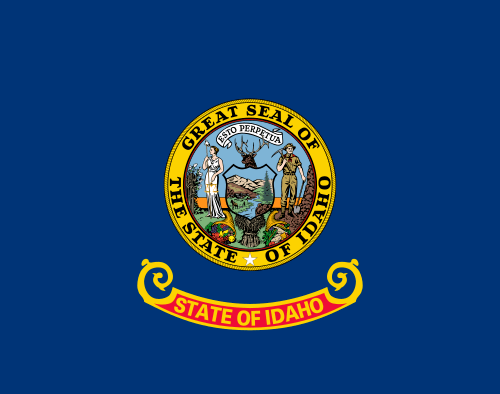 Flag proposal for Idaho I made in 2009. 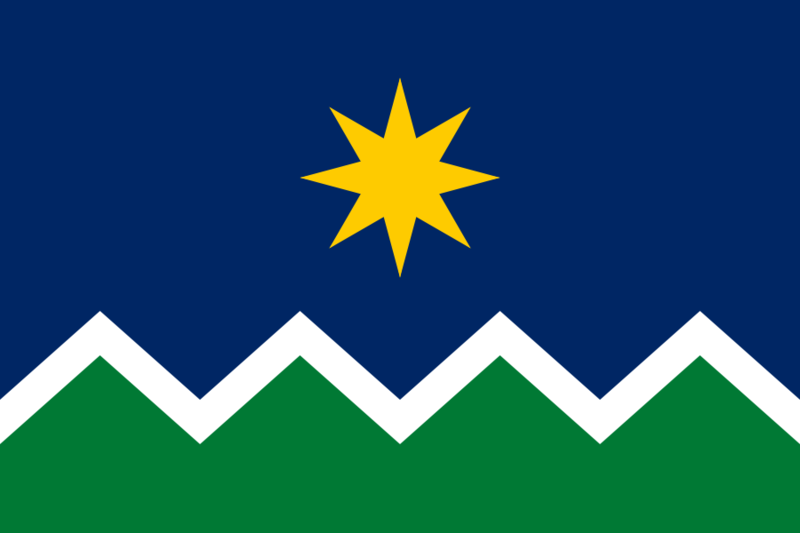 The overall design depicts mountainous terrain underneath a blue sky, which is in the same shade as the blue on the national flag. The eight pointed star represents the sun, vitality and life. Its brilliance reflects the official nickname “The Gem State”, with the whole design echoing another nickname, “Gem of the Mountains”. It also represents the high aspirations and achievements of Idaho. More generally, the blue represents the sky and the ocean, the white represents the snow and the green represents the land. The colours are all present on the current flag, so any further symbolism they have can be carried over as well. An official proposal for a new flag for Transnistria is simply the flag of Russia, but in a longer aspect ratio. The reason given was to emphasise closer ties with Russia, but surely, there are ways to reflect that in a flag without copying the same design! People would find it very difficult to tell them apart. Therefore, here is my proposal. Flag proposal for Transnistria I made in 2009. This design uses the same colour scheme as Russia’s, the Pan-Slavic colours, to fulfill the purpose of the current proposal. Because of this, all colour symbolism in the Russian flag can be applied to this design as well. They have no official meanings but a lot of traditional and unofficial meanings can be read here. The Dniester River is the western boundary of Transnistria (the name itself means “beyond the Dniester”) so the leftmost stripe is blue. The white stripe next to it stands for the river bank and the red stripe stands for the nation itself, with the red colour signifying the blood that has been shed for it to exist. 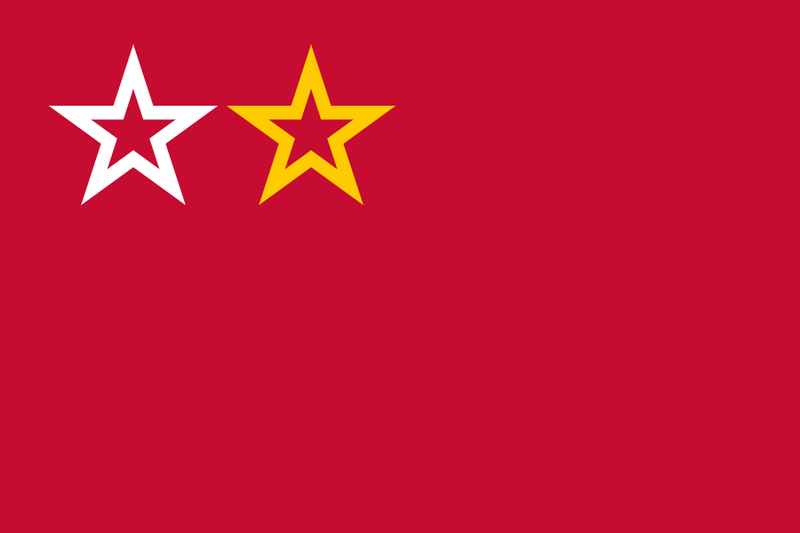 The colour of the main stripe, along with the form of the star, echo parts of the current Soviet-inspired flag. This suggests continuity and reflects its history whilst still remaining unique. 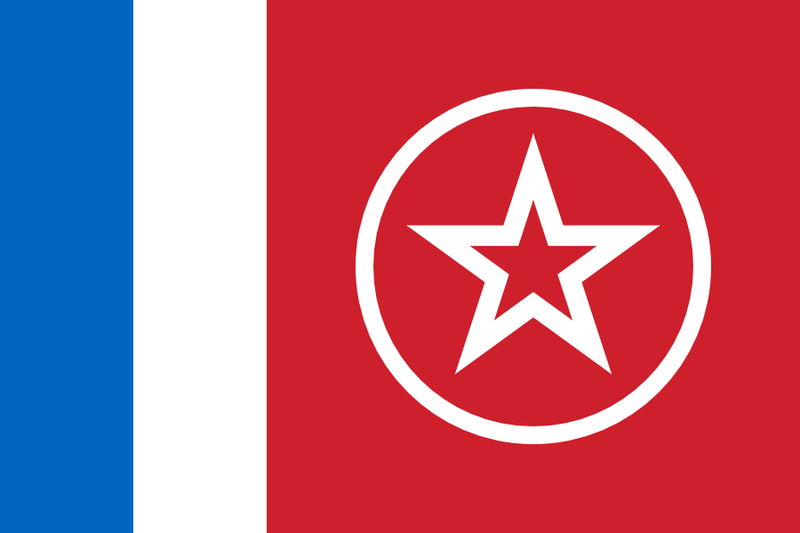 The white star represents peace and the people of Transnistria, and the circle around it represents unity. 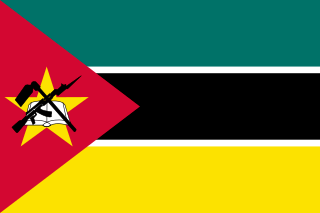 A problem identified with the current Mozambican flag is that it features an AK-47 (a type of machine gun), which gives the impression that the country is warlike and undemocratic. Also, it was adopted during an era of single-party rule, which is no longer the situation. This has prompted two official contests, however none of the results were deemed satisfactory. Therefore, here is my proposal. 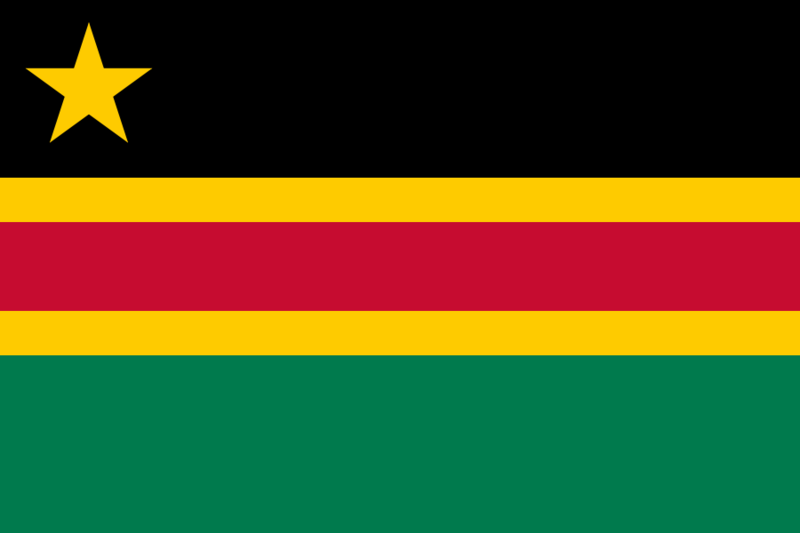 Proposed flag of Mozambique I made in 2009. Yellow: The mineral wealth of the country and the sunshine. Blue: The sky and sea. Black: The people, not only those in Mozambique but also in the whole of Africa. Green: The land, agriculture and natural environment. White: Peace and a bright future. Red: The blood that we all share and that has been shed in the past. 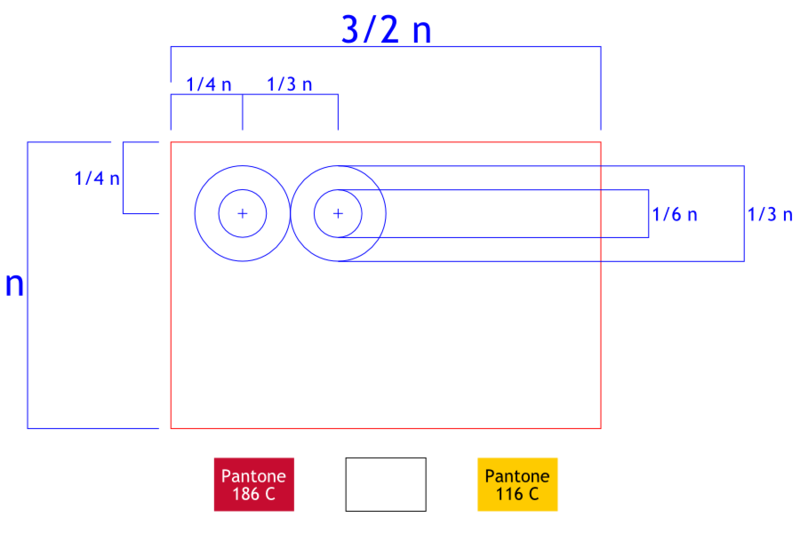 The colours are all derived from the current flag, with the addition of blue. 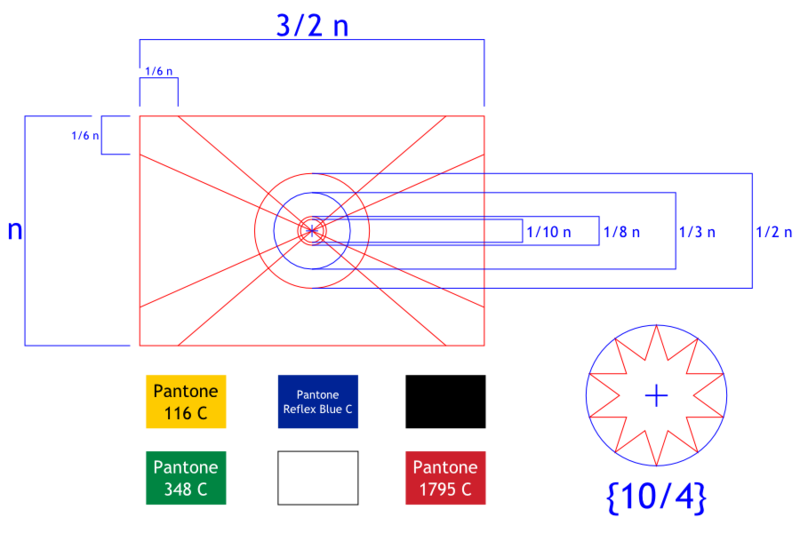 This means that any further colour symbolism they have can also be carried over. The blue was added so that the colours of both main political parties are represented. Also, the layout reflects how the land (green) is to the west of the sea (blue), and the sunshine (yellow) comes down onto the people (black). The sun in general represents warmth, vitality and life. It also represents equality, since the sun shines for everyone, unity, since it is one object, and power, since it contains so much energy. Just like in the coat of arms, it specifically stands for a new beginning for Mozambique; a bright future, positive, optimistic and inevitable. 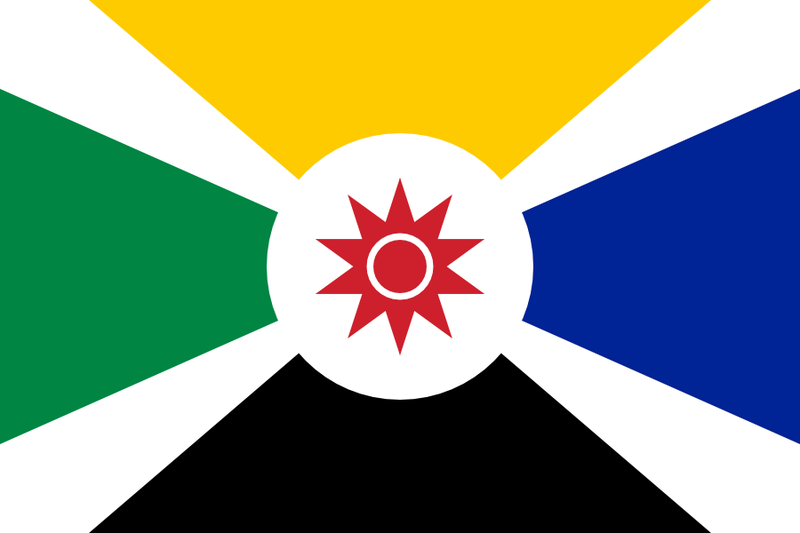 Its ten points represent the ten provinces, with the central circle standing for the capital city (which has provincial status). The pattern of rays represents hope for peace (white) to every corner of Mozambique. Lastly, the background has four colours in equal amounts, suggesting that despite the differences of the people in the country, they are all equal in terms of votes (democracy) and the law (justice). Critics of the current flag contend that it is too attached to the past (the emblem was intended to echo the Soviet hammer-and-sickle), does not reflect the change in situation and gives a bad impression of the country by looking aggressive, pessimistic and warlike (it features a machete, for example). This has prompted an official contest to produce a more optimistic design, but the result was heavily opposed. It was said to be too similar to other countries’ flags (Costa Rica and North Korea), to have no relevant meaning, to neglect the country’s history and to look ugly and childish (it’s got a cave drawing on it). Therefore, here is my proposal. 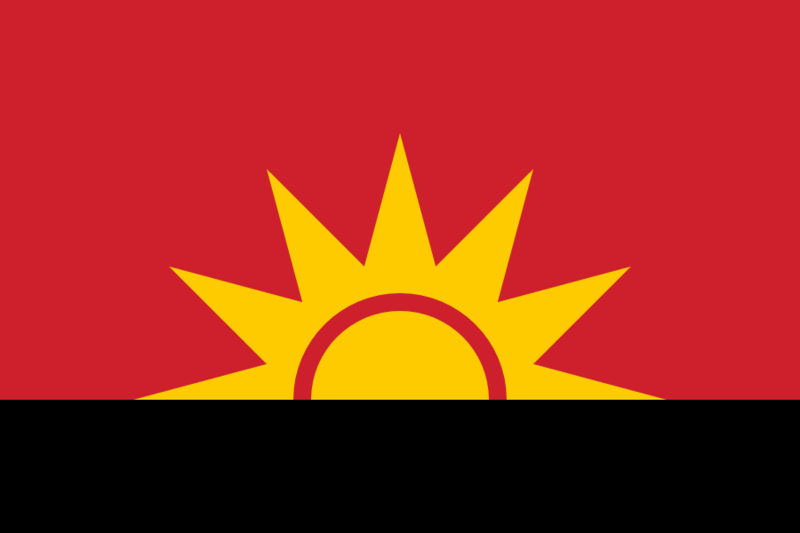 Proposed flag of Angola I made in 2009. The overall scene is intuitive and clear. It depicts the sun rising above the horizon, lighting up the morning sky, inspired by the lower part of the national coat of arms. 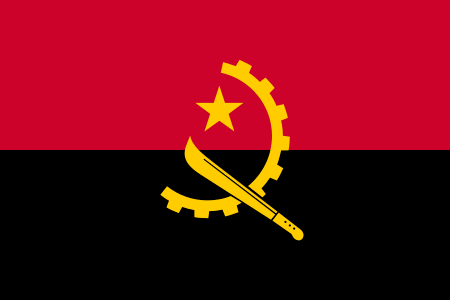 This represents a new beginning for Angola; a bright future, positive, optimistic and inevitable. The sun in general represents warmth, vitality and life. It also represents equality, since the sun shines for everyone, unity, since it is one object, and power, since it contains so much energy. 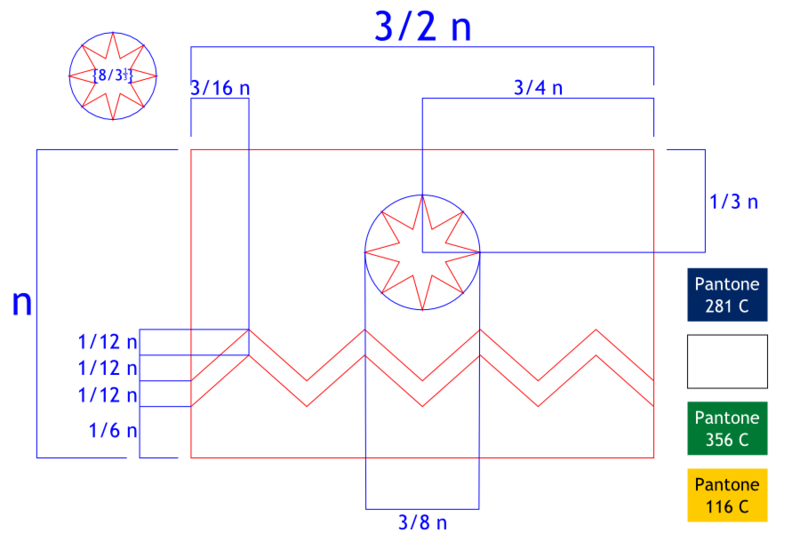 The background layout is derived from the current flag, suggesting continuity and aiding recognition. Apart from being the sky and the ground, referenced in the above paragraph, it also symbolises the country’s past. The red represents the bloodshed and the black represents the dark parts of Angola’s history. The rising sun symbolises a force that will remove these aspects from the whole of the country. 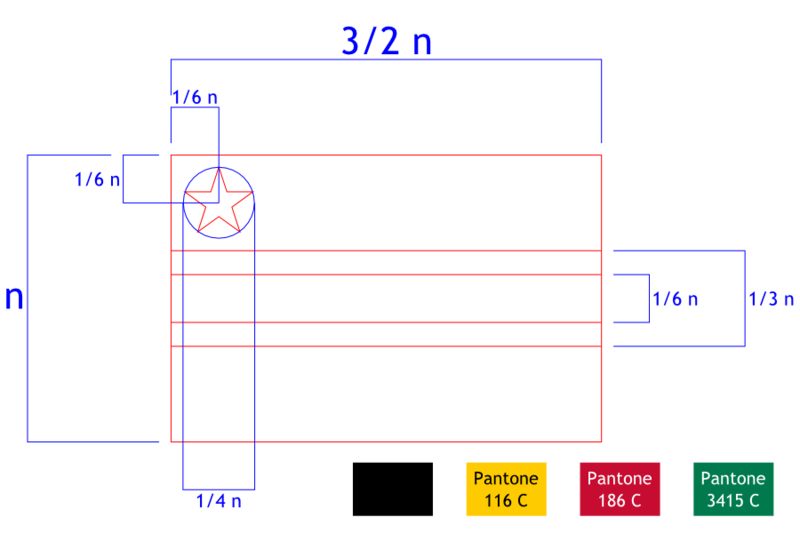 The individual colours of the flag have additional meanings. The red represents the blood that we all share, suggesting unity and equality. The black represents the people, not only those in Angola but also in the whole of Africa. The yellow represents the mineral wealth of the country. These colours are all present in the current flag, so any further symbolism they have can be carried over as well.